Three or four years ago I’m sure I would have been one of the first bloggers through the doors of a new restaurant. Over the last few years the sands have shifted and every new opening seems to be even better at getting their name out there than the last. The Nottingham Post seem to have their finger more on the pulse with their food coverage too (though the same can’t be said for their restaurant reviews but that’s a story for another day!). The blogging community has also grown so despite it still being Mowgli’s first few weeks in Nottingham it feels as though I am amongst the last to visit. The Mowgli empire started in the North West and now have 2 Liverpool Restaurants, 1 in Manchester, 1 in Birmingham and 1 in Oxford. There are already plans for more, as well as the Mowgli cookbook that came out earlier in 2018, the founder Nisha has become somewhat of a celebrity in her own right. Part of their appeal is the stylishness of the spaces that they occupy and a good job has been made to continue this trend in Hockley. Much has been made of their swings and whilst they are a PR tour de force the most impressive thing is the utilisation of such a small space for both capacity and fashion. The menu is essentially split into street food and curries but sections both again into meat and vegetarian options. There a good but not overwhelming number of dishes and variety of options for avid meat eaters and vegans alike. There were also good beer choices which is a big deal when usually its Cobra or Kingfisher at Indian restaurants, I selected a Brewdog Vagabond this on occasion. There is a good-looking, if small, wine list as well as an appealing selection of cocktails. I was lucky to go with a few other people which allowed me to try a pretty wide range of dishes. A popular choice were the tiffin boxes, the meaty one £16, veggie for £14 which includes 2 curries a dhal and rice. Interestingly each of these differs with 3 versions on our table having completely different dishes. My favourite of the main dishes were the keema and house lamb curry. Both well spiced, depth of meaty flavour and warmth but not heat. 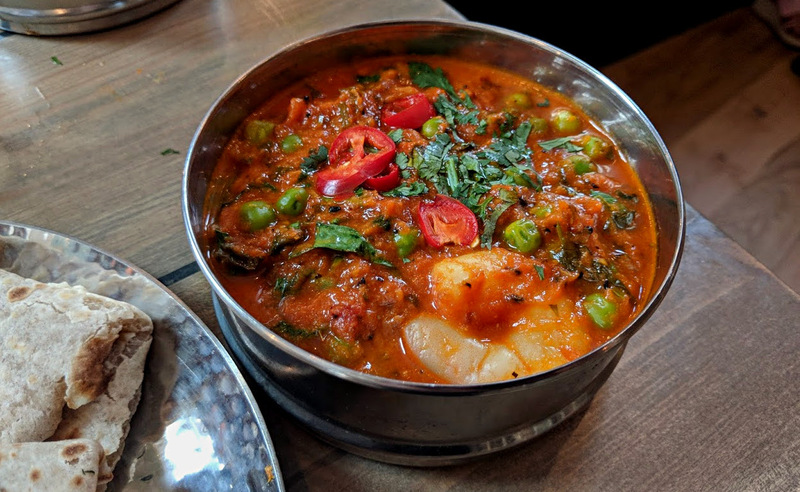 They were better than the butter chicken and prawn curries, the latter impressing with the generosity of the shellfish for £6.95 but both had a tomato sweetness that overwhelmed any more subtle flavours. 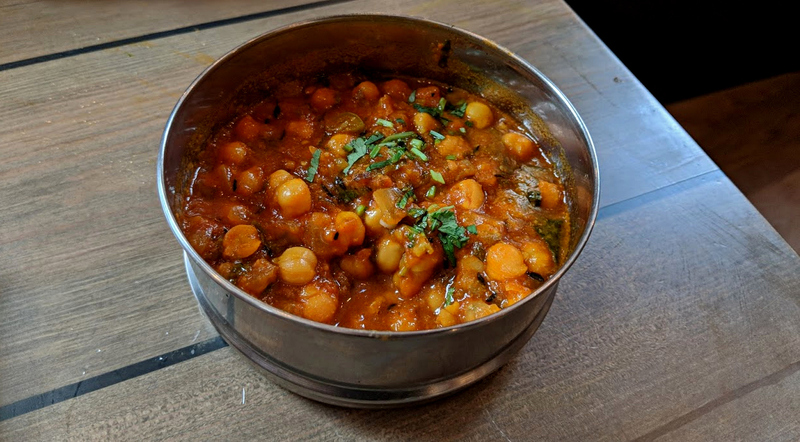 Vegetarian dishes were more consistently strong, tea steeped chickpeas my favourite alongside a good dhal that was a fragrant combination of ginger, cumin and rhubarb. A friends treacle fries (£5.95) were the best of the street food dishes, sticky and sweet with the treacle and rich, tangy flavour from the tamarind. My Bel Puri (£4.50) was nice but less impressive. Puffed rice and other crispy little bits had a little sweet and sour dressing that was tasty enough but a struggle to get past how dry it was. It was all the more difficult to overcome that as the dish arrived well before any drinks that were required to wash it down. Sadly poor service was a theme of the evening, even with the benefit of the doubt of it being the early days of the restaurant. Alongside the late arrival of drinks, our requested water required us asking for it again on 2 separate occasions. Some dishes were delivered to our table briefly before realising they were actually for another. We had also ordered the restaurants signature dish, Chat Bombs but they never arrived, though the team happily removed them from our bill without fuss. In isolation I might not even mention these things but together they did impact the enjoyment of the evening. 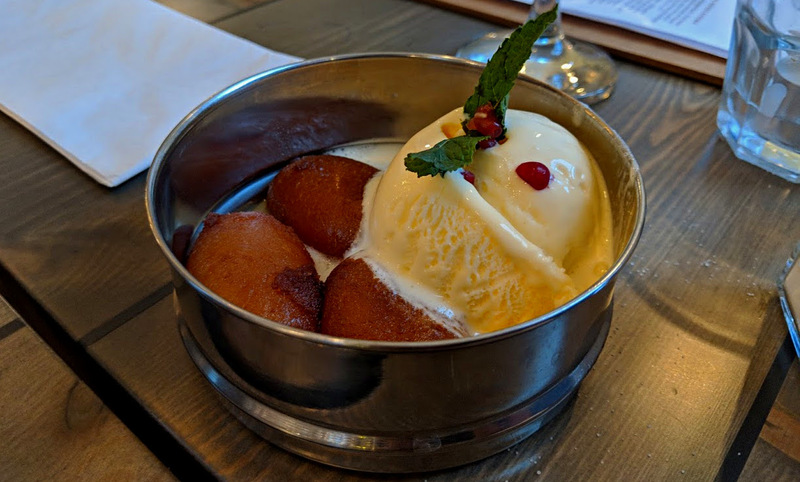 Back to the food and I must say I did finish with a rather good Gulab Jamun (£4.50), perhaps the most famous of Indian desserts. Dough balls are soaked in a sweet, sugary sauce and can be heavy and cloying but these were nice and light. The service might be down to a bad day but regardless of that the food at Mowgli didn’t really blow me away. Don’t get me wrong, I can certainly see the appeal. The quality of the food isn’t even the point, though its certainly good. The popularity comes in the style of Indian that sets it apart from these other establishments. The restaurants I refer to don’t have the same pretty, modern interior. More people will be drinking cocktails here than at any other Indian in Nottingham, if others even offer them. The “street food” approach of smaller plates will also appeal, apart from the fact you get to try more food it’s also lighter food in smaller portions. The value is also good as a typical chicken curry and rice will cost you over £16 at the highest end places in the city and here you get their tiffin offer of 2 curries a side and rice for the same money.